The first time I spoke to Jeff he was sitting alone in silence. He was fidgety, rearranging himself on a small cushion, presumably to ease the burden of sitting in a hard chair. He looked up at me and said hello; I sat down next to him. That initial conversation was over a year ago and we’ve been talking several times a week ever since. Jeff is 77. He is also my friend. It’s difficult for me to recall exactly how and when we transitioned from casual acquaintances to friends, being from two very different generations and all, but it happened and somehow our unlikely connection works. I see him often in daily life as we frequent the same places; sometimes we talk for 10 minutes, sometimes for longer. More often than not we talk about sleep; Jeff and I are both insomniacs and we each have a wealth of experience to share about how many hours we managed to rest the night before or how long we lay in bed wide awake. We also talk about poetry; Jeff is a poet, or rather, he “writes poetry” — a distinction he makes repeatedly. In his eyes, to label oneself a poet is an act of arrogance and so he continues to correct anyone who may call him a poet. He references specific poems often in conversation, to the point where I finally asked him if I could read one, my curiosity sufficiently piqued. 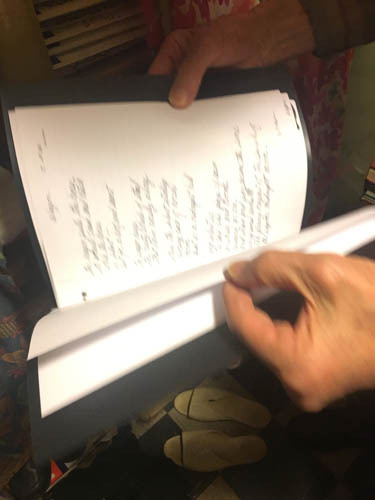 Jeff happily obliged and gifted me with a small set of poems selected from 40 years of writing. Before we get to the latest insomnia news or poetry discussions, we check in about the day-to-day goings on of our lives. Depending on the amount of time we have to chat, Jeff will sometimes go off on tangents, inspired by some present-day detail to share a story from his past. I've gleaned quite the cache of personal tidbits as a result of these tangents and I look forward to these conversational detours. When he shares, his whole energy changes and his rate of speech speeds up to match his excitement. He speaks with a clarity and pace that contradict his age and make him an excellent storyteller. I am not the only one who enjoys hearing what he has to say; Jeff makes friends easily and with people of all ages. Though he interacts often with those who enjoy his company, the interactions are generally brief and sometimes no more than a friendly “Hello! How are you?”. I know he is lonely because he’s told me so; living alone with no family to speak of, he struggles with feeling connected and wishes he was part of a crowd. Out of concern and empathy for my friend, I make the effort to sit down with him and really listen, more so than I do with most other people in my life. This dedication is part of what inspired me to ask Jeff if I could interview him; the other part is a selfish desire to know more, the stories and run-ins no longer sufficient. Eager for the human interaction, Jeff agreed to my request immediately. 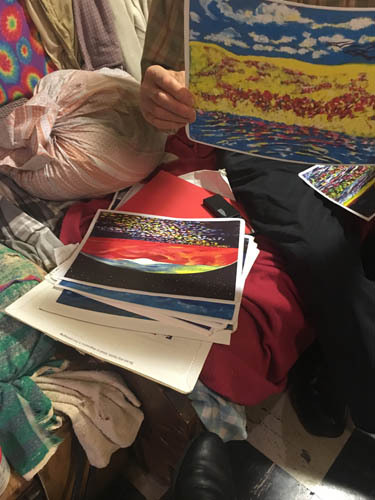 We decided to meet on a Sunday evening at his home in the East Village where he lives in a building behind a building, up several flights of stairs, in a tiny studio which he has occupied for 47 years. For a handful of hours, several months ago, I got a peek at the life behind our conversations, the stories and the poetry. His apartment, essentially a museum of Jeff, serves almost as an isolation chamber. Seeing the small space in which he spends his time, day in and day out, I could see even more clearly why conversation is so important to him. There in his home, he alone is the source of his entertainment. It is no wonder he is a writer; that kind of solitude is nothing if not the perfect soil from which creative expression might grow. He eschews technology, either by fiscal necessity or principle, I'm not sure which. Honestly, I was so struck by the insight into his private world I never thought to ask. He owns no television, nor any type of computer. Everything he reads is in print; everything he writes, done by hand or on a typewriter. Given his strictly analog lifestyle, Jeff's world involves a lot of paper. 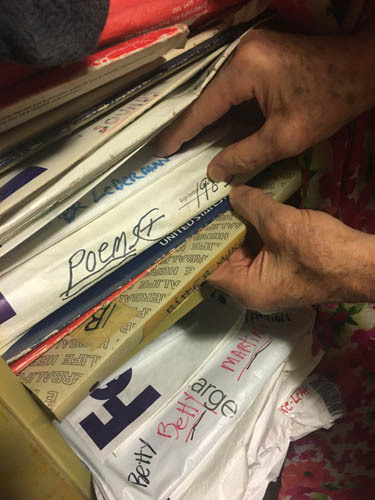 His poems are either typed or written longhand in the most beautiful, elegant old-fashioned script, all copied and collated in a myriad of binders, boxes. 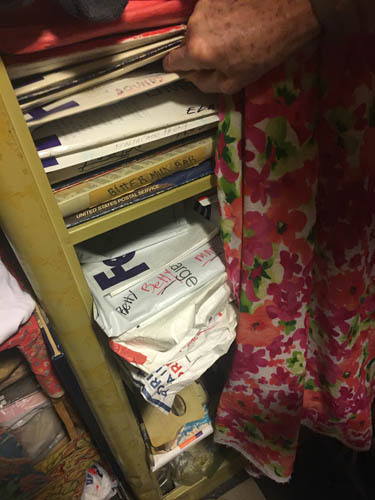 He uses FedEx envelopes to separate small selections as means of packaging for distribution, the outsides labeled with details on contents and recipients. His many notes, reminding him of daily appointments and other tidbits of information he needs to remember, are jotted down on scraps of paper in teeny tiny print; these notes stuff his wallet and surround the area around his desk. Still other documents occupy his pockets and every nook and cranny of his home — a letter from Allen Ginsberg, random articles, phone numbers, casual thoughts — I could have spent hours just reading all of the different papers posted all over his apartment. Among the many many books of poems, there are boxes and other packages filled with small paintings. Jeff has painted for almost as many years as he has written poetry, yet another form of personal expression. His color choices are surreal, the paintings largely abstract and born of feelings; the imagery loosely evoking a sense of science fiction and fantasy. He paints in acrylics and watercolors on loose pieces of paper. Sometimes a piece will encompass several pages as a large tiled work but mostly each fills an entire single page. During my visit, he picked out a series and laid them out upon his furniture so I could see the whole set together. I couldn't help but think of a story he has shared with me repeatedly, of his time living in Mexico as a younger man. The purpose of the trip was adventure he said, acting on the impulse to run off into the unknown. Once there, he was so struck by the quality and abundance of color, that he proceeded to spend everyday teaching himself how to mix paint for sole the purpose of precisely replicating what he saw all around him. Between the boxes and books and notes, there are bizarre little knickknacks — tiny figurines, old signs, a tiny stuffed animal — it's cluttered but not haphazard; everything is meticulously arranged and organized. His kitchen walls are wallpapered with labels from food packaging, yellowed with age. No closet, no real bed; he stores his clothing and hats on the walls around the apartment, he sleeps on a futon that appears to only fit in the space being upright in the “couch” position. As I mentioned, Jeff struggles with sleep. It did not surprise me much to see such a small and awkward space devoted to rest. When I met with Jeff that day in his apartment, he had been especially anxious, having not been able to sleep at all the night before. He didn’t feel he was at his best but felt worse about the prospect of cancelling so we proceeded. He was noticeably worried but his state had little effect on his ability to engage in conversation. I’m sure he felt out of sorts and not like himself, but to know Jeff is to know his anxiety and discomfort from not sleeping. It was all very much in line with spending time with him in any other setting. Of all the many details and nuances I have learned through both the interview and our weekly conversations, the greatest insight of all was when Jeff described what motivates him to write poetry, something he didn't share until the very end of my visit. He told me that night the reason is that he needs to see himself on the page. He learns about who he is by sitting down to write that which flows into his mind, everything a mystery till it appears in front of him by his own hand. I see him on this page, these words painting his picture as I write them, as I read over them. Attempting to capture the many details of my friend, to create a meaningful and authentic portrait of a man I respect and admire, is perhaps my own attempt to see myself on the page, reflected through his image. Whatever the reason, Jeff is an inspiration to me and will forever remain in my heart.